Governor Nyesom Wike yesterday started probe of the administration of his predecessor, Chibuike Amaechi as he constituted a seven man Judicial Commission of Inquiry headed by Justice George Omereji to investigate alleged sale of some state assets as well as the projects for which funds were allegedly released but not executed. The panel was inaugurated Friday in Port Harcourt, the state capital. Mr. Wike, a former member of the Amaechi administration who later fell out with his boss, has accused Amaechi and others of stealing properties belonging to the government. He has vowed to recover them. Mr. Amaechi denies the allegation, and says the governor’s mission is to tarnish his image. On Thursday, state agents said they recovered a vehicle belonging to the government from a former Commissioner for Information, Ibim Semenitari. Mr. Semenitari claims ownership of the vehicle. She said the car was allocated to her as part of the government’s monetization policy. The Judicial Commission of Inquiry which has 23 terms of reference has one month to turn in its report. Wike’s action was coming against the backdrop of claims by Amaechi’s former Deputy, Tele Ikuru that the former administration under which he served was the most corrupt in the state. Wike and Amaechi Ikuru alleged that his former boss allegedly spent N812 million to furnish his private residence. The former deputy governor spoke at Government House, Port Harcourt yesterday while handing over the final report of the transition committee he chaired adding that the former government also spent N4.96 billion on the proposed Justice Adolphus Karibi Whyte Hospital with no structures on the ground. 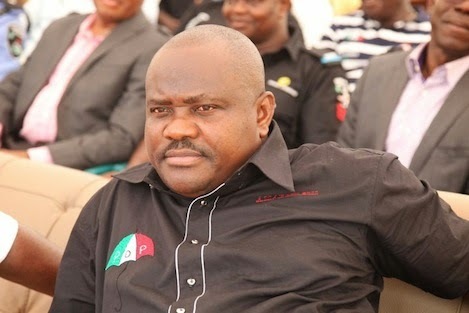 However Wike said: “In exercise of the powers conferred upon me by Section 2 (1) of the Commissions of Inquiry Law of Rivers State (Cap 30), 1999 and all other powers enabling me in that regard, I Nyesom Ezenwo Wike, Governor of Rivers State, hereby constitute and appoint a Judicial Commission of Inquiry for the investigation of the administration of Governor Chibuike Amaechi”. He asked the Commission of Inquiry to investigate the sale of Omoku 150 MW Gas Turbine , Adam 360 MW Gas Turbine, Trans-Amadi 136 MW Gas Turbine as well as the Eleme 75 MW Gas Turbine. The Commission of Inquiry is also expected to investigate the mono rail project and the sale of the Olympia Hotel by the Amaechi administration as well as the non execution of the contract for the construction of the Justice Karibi White Hospital after the former administration had paid $250 million to the contractor. Then he directed the Commission of Inquiry to investigate the expenditure of N96 billion from the Rivers State Reserve Fund without compliance with the extant laws as well as make appropriate recommendations that would assist the state government recover proceeds from the gas turbines sold by the former administration. The commission also has the mandate to recover alleged funds wrongfully disbursed on the failed Justice Karibi White Hospital; the alleged funds illegally withdrawn from the state’s Reserve Fund and the alleged N2 billion illegally disbursed under the Agriculture Credit Scheme. Responding, Chairman of the Judicial Commission of Inquiry, Justice Omereji assured the governor that the panel would carry out its assignment diligently and in line with the terms of reference, pointing out that, at the end of the day, the Rivers people would be happy with the job of the commission. Other members of the Commission of Inquiry include Dr Edith Chukwu, Chief Monday Ekekenta, Rev. Canon Alex Usifo and Elder Ignatius Piegbara. Mrs Florence Fiberesima is to serve as secretary while Dr Zacheaus Adango would serve as the counsel to the Commission. Meanwhile, receiving the report of the transition committee he set up from the former Deputy Governor Ikuru, Wike asked President Muhamadu Buhari to support his bid to recover funds allegedly stolen by the past Amaechi’s government.